As far as book-to-movie adaptations go, the Harry Potter films have been unusually strong. It’s hard to retell an already beloved story, not to mention maintain a cast composed largely of child actors across a nine-year stretch. The latter books are long, and Harry Potter and the Deathly Hallows is the only Potter film to be split into two installments. I wasn’t sure about that choice initially, but I’m thrilled with it now, as the series is clearly getting the epic finish that it deserves. We’re halfway through the finale, and as a fan of both the books and the movies, I’m impressed. The film starts off solemnly with Severus Snape (Alan Rickman) sitting at Lord Voldemort’s (Ralph Finnes) table. It’s a haunting, unforgettable opening scene in the novel, and it’s no less creepy on screen. The primary trio of Harry (Daniel Radcliffe), Ron (Rupert Grint) and Hermione (Emma Watson) sets off to find and destroy the Horcruxes: physical objects containing pieces of Voldemort’s soul. All must be destroyed before Voldemort can be killed, but Harry doesn’t know where any of them are or even what all of them are. Meanwhile, Voldemort’s power within the wizarding world and the muggle world grows, and it’s only a matter of time before he fulfills his goal of finding and killing Harry Potter. 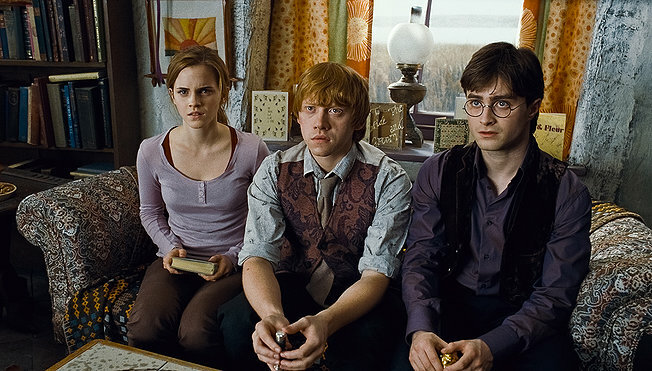 Several elements make this the darkest of the seven Harry Potter films, not the least of which is the color palette. The vibrant colors of the first film are now replaced by varying shades of blue and gray. This makes sense; when Harry saw nothing but magic and wonder in the wizarding world, the visuals reflected that. Also contributing to the heavy tone is the lacking comfort of Hogwarts School. In previous chapters, the familiar school setting helped us feel at home, no matter how perilous the situation, but not this time. Our three teenage heroes are on their own, and despite some gorgeous scenery, it’s a dangerous world out there. As in the book, beloved characters die right and left. The magic exists without polish or cuteness, and the spell-casting battles are fast and frantic. Director David Yates (who also directed Potter 5 and 6) and writer Steve Kloves (who wrote all Potter screenplays except the fifth) have done a masterful job of raising the stakes to the appropriate levels. It’s all or nothing for characters on both sides. Among the unsung heroes of the Potter franchise, none deserve more praise than the casting directors. The acting has consistently been stellar, and in Deathly Hallows, Daniel Radcliffe, Rupert Grint and Emma Watson give their best performances yet. It was impossible to know back in 2001 whether or not the child actors would grow into their roles as well as fans hoped, but the series’ three principal cast members are in their twenties now, and they can act. The casting directors for the first Harry Potter film laid the foundation for the next six films, because the entire franchise would have been doomed from the start if the wrong kids had been picked for those roles. As intense as certain sequences get, viewers may be surprised by the overall amount of quiet and downtime. As a direct result of the decision to devote nearly five hours (between the two parts) to this adaptation, more time was allotted to character work. The downtime is also the quiet before the storm; as readers of the novel are aware, Part 2 will likely feature action from start to finish. Character development was always one of J.K. Rowling’s strengths as an author, and this movie allows its actors to give depth to the characters. There is one scene in particular where Harry comforts Hermione as a friend; it’s not in the book, but it’s true to the characters. If you haven’t read the novel, you’ll mostly be OK as far as understanding goes. You might not remember all the old characters who turn up, and some references will probably be lost on you. The Potter movies have done a good job of communicating important information, though a few pieces got lost in the transfer. In Deathly Hallows, for example, Harry occasionally looks into a shard of a mirror, but previous films neglected to show him getting that mirror from his godfather, Sirius Black. Deathly Hallows also mentions the friendship between Albus Dumbledore and Gellert Grindlewald, but the full significance of that plot piece will be lost on non-readers. The most important elements are in place, though. “The Tale of the Three Brothers,” a fairy tale which explains what the Deathly Hallows are, could have easily been botched or not explained well enough, but the tale is masterfully told through an animated sequence. When the ending credits appeared, the opening-night audience groaned, because Part 1 doesn’t stand on its own. This is clearly only half of a movie, and when the screen cuts to black, it feels like someone has walked into the room and turned the movie off. I prefer the break to cramming it all into one film, but it’s a silly money-making scheme to put eight months between the two installments (this allows for more ticket sales, DVD sales, etc.). Eight months is just long enough for casual viewers to forget what happened in Part 1. Still, Harry Potter and the Deathly Hallows is a serious adaptation that fans can be proud of, and given the quality of Part 1, I have no doubt that Part 2 will be just as good, if not better. We’ll find out next July. MPAA Rating: Rated PG-13 for some sequences of intense action violence, frightening images and brief sensuality. The violence is fast paced and loud, and there’s a scene where Ron bloodies his arm. There’s also a creepy bit involving an old woman and a snake that would almost certainly scare younger kids (heck, it scared me). The brief sensuality comes when Ron is tormented by a vision of Harry and Hermione kissing, and the two are even (unnecessarily) naked at one point during the kiss, though no parts are visible. If you’re looking for a comparison concerning the levels of violent and frightening content, I’d say the graveyard scene in Harry Potter and the Goblet of Fire is on par with the intensity of this film.